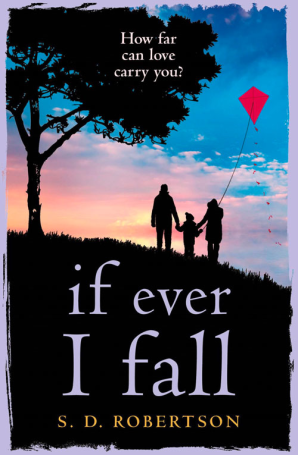 Ever since I read and fell in love with Time To Say Goodbye, I’ve been eagerly awaiting the release of S. D. Robertson’s second novel, If Ever I Fall. Going into this book I had very high expectations and I’m delighted to say that it was one that more than lived up to them. Everything about the book from the stunning cover to the words written on the pages were beautiful and it was a pleasure to be reunited with the author’s writing once again. The story within If Ever I Fall is told through three very different narratives from Maria, her husband Dan and Jack. With Maria’s narrative being presented to us in the form of letters what quickly becomes apparent is that both her and Dan have suffered a terrible loss in their lives which ultimately resulted in the break-up of their marriage. Meanwhile Jack was a man who suffered from amnesia and only knew what he did thanks to Miles, a retired Doctor who he stays with. One thing that I’m finding is that it’s quite hard to write this review without giving too much away to readers which I desperately don’t want to do as I don’t want to ruin it for anyone. Whilst the way in which the story’s told does require a fair amount of concentration in order to keep up with and understand what’s going on, this wasn’t something that prevented me from enjoying the book. It was great to become involved with the lives of Maria, Dan and Jack, accompanying them on their journey and seeing how everything eventually came together in a way that took me by surprise and was completely unexpected. Throughout the book S. D. Robertson has blended several topics together in what can only be described as a truly special way. Firstly this book introduces the reader to the subject of OCD, a condition that I’ve heard of but never really read that much about before, giving an insight into exactly how those with OCD behave. What’s more it also gives a heartbreaking insight into grief, particularly that which parents go through if they lose a child, highlighting the very important fact that people handle grief in different ways. There’s also the subject of amnesia, something which I found both fascinating yet scary to read about in equal measure. All the different themes blend together in an effortless manner, proving that S. D. Robertson really does know what he’s doing when it comes to writing. The only way to appreciate this book, is to read it and I highly recommend that you do for it is a true gem with a story that will stay with me for such a long time yet to come. S. D. Robertson is an author whose writing I truly adore and I hope we’ll be treated to another book written by him in the future. Outside, the fresh sea air feels great on my skin. Despite what I’ve told Miles, I can’t resist walking over to the rickety fence and peering down the jagged cliff face to the swirling sea, which looks chilly and agitated. I’m not sure what time of year it is, which is an odd feeling, yet I’m dressed for winter in a jumper and jacket. That must be right, I think. The sun might be out, but there’s no warmth, especially in the coastal breeze. I take in my surroundings, noting the bare branches of the few trees nearby and the lack of any flowers. Then I look back at the house: a last outpost of civilisation in this remote spot, as worn and neglected as it is imposing. There’s so much still to be done, I think, eyeing all the flaking paintwork, rotten wood and damaged roof tiles. No wonder Miles needs my help. Wandering over to the rear of the house, I come across a mud-caked green Land Rover parked at the top of a winding dirt track. I assume this leads to a proper road. The car looks old but functional. I stare down the track; just knowing for sure that there’s an actual route to civilisation comes as a relief. ‘Sorry?’ I say, cupping one ear and moving closer. ‘There,’ he replies, pointing to a spot of overgrown grass and a mound of earth to my left-hand side. Despite having a good look around, I’ve no idea what he’s talking about. I shrug, perplexed. ‘That pile of soil,’ he says, pointing again. ‘It’s where I found you unconscious after your accident. ‘Really?’ I look again, but still nothing comes back. I go to it, run my hands over the cold aluminium, but it’s as unfamiliar as the rest. I stop mid-sentence as something catches my eye: a flash of red in my peripheral vision. I turn in that direction, but there’s nothing there. ‘You all right?’ Miles calls down to me. I’m convinced the red is from the woman I spotted out of the window yesterday: the slender figure looking over the cliff, who Miles claimed not to have seen. There’s no logic to this other than the fact that she was wearing a red coat, but I’m gripped by the notion and I race in that direction to try to catch her. There’s no sign of her at the front of the house. I’m confused. I look all around, casting my eye up and down the coastline. I retrace my steps to the rear of the house, taking care to stay out of Miles’s view, but still no luck. Eventually, after several minutes of scratching my head, I figure I must have imagined it. It’s the only rational explanation. I have had a recent head trauma. Seeing flashes of colour is probably a side effect. Besides, if I’m to believe Miles, I probably imagined her in the first place. And yet somehow I’m still not convinced of that. The first time I saw her she was so realistic, so alive. I return to the front of the house and decide to walk to the place along the clifftop where I first saw the mysterious woman in red. Miles wouldn’t approve, but what he doesn’t know won’t hurt him. I soon reach the spot, but of course she’s not there and there’s no sign of her either. So I carry on, focusing on a crooked sea stack in the distance that reminds me of a witch’s nose. I take in the cool, fresh air with deep breaths – as slow as I can manage – in a bid to calm myself down. I feel all worked up; my shoulders ache. I hadn’t realised how tense I was until now. Having no memory is so frustrating; how can I understand myself when my past is a mystery? My mind is like an empty library: useless without the volumes of knowledge that define it. I’m picturing that image in my mind when it’s ripped apart and set alight by the burning arrow of another memory. It’s dark and the streets are full of monsters with bags of loot. She looks up at my attempt at facial contortion and giggles while pressing the bell. ‘Wow! You do look scary,’ booms the large bald man who answers. ‘I’d better give you some sweets, hadn’t I? He reaches to grab a big bowl of mini chocolates from a shelf above a coat rack standing beside the door. How strange, I think. All the jackets hanging there are red. As the little ghost reaches out, the man turns to me. ‘Are you okay?’ he asks. His voice is different now, though. It sounds female. Like that of a young woman. What’s happening? One moment I’m looking him in the eye, wondering what the hell is going on with his voice, and the next everything fades to black. I’m shouting out, but I can’t hear myself, like I’ve been muted. I’m confused, afraid. Then I hear that voice again. It definitely sounds like a young woman; maybe a teenager. The tone reassures me somehow. It seems familiar, although I can’t put my finger on why. Bright sky is above me: light blue with fluffy sheep clouds. I turn my head to the right, feel damp grass under my cheek and view the sea through the gaps in the rickety fence. Why am I lying on the ground? What happened? I heave myself up. First into a sitting position and then, once I’m sure everything’s working, on to my feet. I feel dizzy, especially when I look at the sea far below. There’s a twinge from my head, but nothing like the pain I felt when I first woke up after the accident. I must have fainted or passed out. It didn’t feel like that, though. It was more like I was in a trance – reliving a forgotten memory, as I had before. So who was the young girl trick-or-treating with me? Was the little ghost my daughter? It felt like she was. But how can I be a father and not remember? That’s not the kind of thing you ever forget, is it? I must be mistaken. Maybe she was a niece, a young sister or a friend’s daughter. Perhaps it wasn’t a memory at all. It could have been a scene I watched in a film, although again it felt so real. I think back to the feeling I keep having that I should be somewhere else, with someone else. Maybe there’s a good reason for that. I shiver in the wind. What about the older girl’s voice that spoke to me at the end? She told me to get up. She said I wasn’t safe. Was she right? And why did she sound so familiar? I turn 360 degrees, scanning the open space in every direction for some clue. And then I see her: far in the distance along the clifftop, in the opposite direction from which I was walking. The woman in red. Or maybe not a woman at all. Could she be the one who just spoke to me? Could she be a girl? A teenager? She looks identical to the last time I saw her; same jeans and knee-length coat, billowing long black hair. She’s looking at me, although she’s some distance away: too far to clearly make out her face. So how could she have been talking to me? She doesn’t react, so I wave my hands above my head, staring at her the whole time and shouting some more. She stands there, hands in her pockets, looking straight at me but through me. Then I blink and she’s gone.